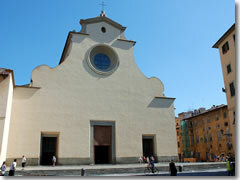 The blank plaster non-facade of the church of Santo Spirito hides a perfection of Brunelleschian architecture inside, along with some fine altarpieces. Santo Spirito is perhaps the single best example of what Brunelleschi would design if allowed free reign over the plans for an entire church—as opposed to just a chapel, as at Santa Croce, or (ahem) a dome the Cathedral. Admittedly, it was built mostly after the architect's death, and slightly altered to accommodate the changing tastes of the late 15th century. But on the whole, Santo Spirito is classic Brunelleschian: a cavernous but harmonious space, the architecture emphasized by leaving the walls blank and creamy while the architectural lines are all accented in dark gray pietra serena stonework. The only thing out of place is the fanciful carved, inlaid, and statue-studded high altar baldacchino, a baroque work which dates from the early 17th century—nice enough on its own, but out of place plopped down amid all this High Renaissance architecture. 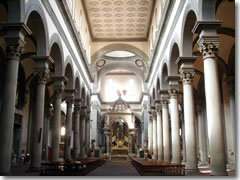 The interior of Santo Spirito. (Photo by Sailko)The wide aisles are lined by chapels, each containing a fairly notable altarpiece—none true masterpieces, but altogether impressive for the sheer number of excellent works of art they collectively represent. Most churches have one chapel with a stunner or a painting by some big name, but the rest usually contain a bunch of also-ran baroque fussiness. By contrast, almost every one of Santo Spirito's chapels has a painting worth spending a few minutes on—even the ones that are unattributed (the unknown artists usually called "Master of the [painting title] of Santo Spirito"). Among the highlights are altarpieces by Passignano, Filippino Lippi, Verrocchio, Perugino (actually a copy, but a good one), Alessandro Allori, Cosimo Rosselli, and Raffaelo dei Carli—plus a carved one by Sansovino. This Last Supper fresco by Andrea Orcagna is in absolutely terrible shape—pretty much all that remains are 1.5 apostles plus a halo—but the Crucifixion he frescoed above it is, while also damaged, pretty dramatic, with flocks of angels and gaggle of soldiers. Orcagna also did the Madonna and Child on the far wall. There are also a bunch of nice statues and stone carvings. 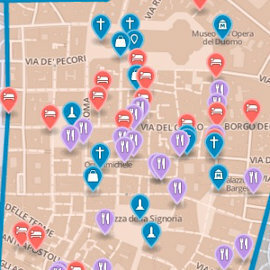 How long does Chiesa di Santo Spirito take? Planning your day: This church surprised me the first time I went in by gobbling up an hour. You might be so taken with all the works of art as I was, so figure on 30 minutes, plus another 15 to visit the neighboring museum. You can attend mass Sundays at 9am, 10:30am, and 6pm; Mon–Sat at 9am and 6pm (Wed at 9am only). Piazza Santo Spirito is the heart of the Oltrarno, tree-shaded and lined by ancient buildings, many of which now contain cafes or restaurants, most of them quite good.